Tesla offers leasing options for new Model S in U.S.
(Reuters) -- Tesla Motors Inc. unveiled a leasing policy for its new Model S with an option for buyers in the United States to return the car within three months of purchase. U.S. Bank will offer a lease for buyers of the new Model S, lowering monthly lease payments by as much as 25 percent, Tesla CEO Elon Musk said in a blog post dated Oct. 25. 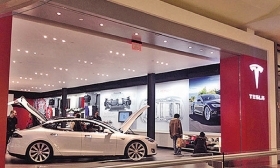 Automotive News reported Tesla's leasing plans in an Oct. 6 story. Last year Tesla announced a partnership with Wells Fargo & Co. and U.S. Bank to offer a 10 percent down payment on the purchase of a Model S sedan.